The Maltese people are one of the warmest, kindest and friendliest nations on Earth, they happily not only talk to strangers but frequently help them in difficulties. If this is down to Christian teaching rather than character or culture, it makes for a very pleasant and safe tourist destination. The long-standing association with Britain is perhaps of help and the Maltese do seem to like all things British, the Queen and Royal Family and holidays in England. British shops and trademarks are very well respresented in Malta, you will see Early Learning Cantre, Marks and Spencer, Monsoon and other typically British retailers. One thing which is different is the pub. 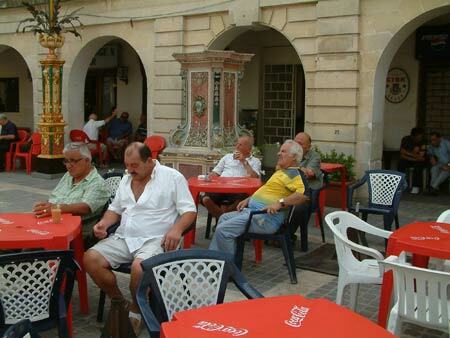 There is the odd Irish pub but in the main, Maltese pubs are typically Meditteranean style coffee shops also selling alcoholic drinks and frequented by older men. The women still stay home to look after the family while their men congregate to chat and play games in the evening. Politics is an essential part of every adults' life. When people vote the turnout can be above 80%. The Maltese airline offers discounts to any Maltese returning home to vote. People get excited about their political party and celebrate wins at party offices. Band clubs are another distinctly Maltese feature. Each town has a band club or two where their band meets and practices. The bands add music and colour to local festivals and events. Family life is still very important to the Maltese, as is church going on Sunday and feast days. The celebration of the Catholic calendar means that there is a Carnival before Lent when people let their hair down before the period of fasting, various feast days with colourful processions and church on Sundays in their Sunday best. Some people even have a Sunday car for best. The churches in Malta are generally large and ornate. None more so than the Mosta Dome which is the 3rd largest dome in Europe - an amazing achievement for the smallest country. The hot weather during the summer months ensures that a siesta is still taken during thre heat of the afternoon. Shops close for a few hours whilst people sleep. 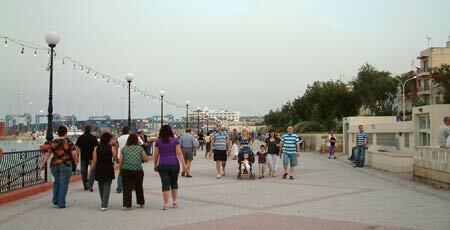 However, come the evening when the weather is cooler, the Maltese take to the streets and beaches, promenading, meeting with friends, taking children to the swing parks and enjoying barbecues. An afternoon nap is essential if you party until late.